Dr. Dyke is an assistant professor of surgery at UND and an attending cardiothoracic surgeon for Sanford Health in Fargo. He is a native of Baltimore, Maryland, received his undergraduate degree from Duke University, Trinity College. He earned his medical doctorate from Duke University School of Medicine, where he was elected to membership in Alpha Omega Alpha, the national medical honor society. He completed his surgery residency at the Medical College of Virginia in Richmond, where he served as chief resident and became a Fellow in Cardiothoracic Surgery. In addition, he was awarded the 43rd Evarts Graham Fellowship by the American Association for Thoracic Surgery for study at Harefield Hospital, London, England. 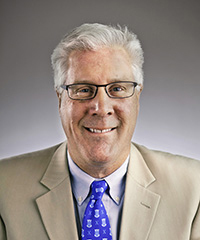 Since 2012, Dyke has practiced with Sanford Health and has been an assistant professor of surgery at UNDSMHS. Before joining Sanford and UND, he practiced with SouthEast Texas Cardiovascular Surgery Associates in Houston. Dyke is a Diplomate of the American Board of Surgery and the American Board of Thoracic Surgery.